MarCom WG 185 – Ports on Greenfield Sites -now released. 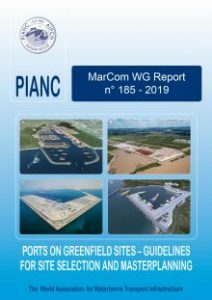 PIANC MarCom WG 185 – ‘Ports on Greenfield Sites – Guidelines for Site Selection and Masterplanning‘ has been released! Please click here to download the press release for more details. PIANC members can download their free copy in the PIANC Members Only Section on the PIANC website, non-members can purchase their copy at https://www.pianc.org/publications/marcom.